Unassembled furniture is available from many retailers, including online and traditional stores. Mass merchandisers like Walmart, K Mart and Target all carry a selection of affordable knock-down furniture. Low cost unassembled furniture kits are also often found at discount stores like Big Lots and furniture outlets. If you prefer the look of Scandinavian modern furniture, Ikea also sells unassembled furniture. 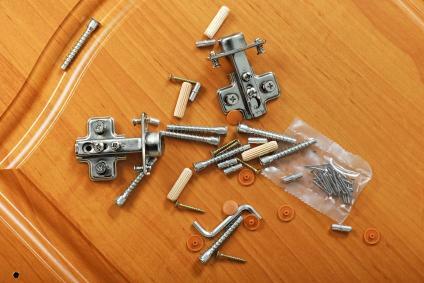 Examples of online resources for affordable ready-to-assemble furniture are detailed below. The sleek minimalist Scandinavian style furniture found in the Ikea showrooms is also available to online shoppers. Ikea's selection of unassembled furniture includes everything from bookcases to cribs. There is not much you can't find there. Ikea online also features a list of instructions for assembling the company's products. The Log Furniture Store offers an economy line of beautiful rustic furniture unassembled. The log furniture kits include sanded white cedar furniture sections, glue and non-rusting nails. If you prefer, you can attach the pieces with deck screws instead of the nails. The Log Store selection of unassembled pieces includes furniture for the living room, bedroom and dining room. Of the 18 pieces available for bedrooms, only the nightstand with drawers and dressers are not available unassembled. Dining room furniture selections include seventeen products, including 11 different types of tables. The rustic log furniture living room collection includes 13 different pieces, giving you the option of choosing the perfect furniture for your needs. The leading manufacturer of affordable unassembled furniture, Sauder ready-to-assemble furniture is available at many stores and online retailers. The company manufactures a full line of home furnishings in 30 different furniture collections for all rooms of your home. If you have always wanted to try your hand at woodworking but do not have the tools or the space, putting together inexpensive unassembled furniture gives you the satisfaction of building lovely additions to your home's décor. With the wide variety of furniture kits available, there is sure to be the perfect piece of furniture to fit your style and your budget.